BELLEVUE, Wash., May 7, 2018 /PRNewswire/ -- Nintex, the world's leader in intelligent process automation (IPA), has recognized MAN Diesel & Turbo with a 2018 Nintex Solution Innovation Award for successfully transforming company-wide HR requests and approval processes with the Nintex Platform. MAN Diesel & Turbo turned to Nintex App Studio, Nintex Forms, and Nintex Workflow to digitally transform its HR processes and beyond by automating traditionally paper-based requests that require the completion of a form as well as signature. With Nintex, MAN Diesel & Turbo is automating all its business processes requiring signature approvals which the company estimates will save more than $600,000 (USD) annually once deployed company-wide. "There is a process for everything at MAN Diesel & Turbo and most processes involve a form of some kind," says Fernando Nunes, systems consultant at MAN Diesel & Turbo. "Nintex is keeping our organization moving forward by saving us a tremendous amount of money while automating these processes which makes our employees very happy." Before Nintex, requests and approval processes at MAN Diesel & Turbo were manual and time-consuming, requiring employees to print, sign, and scan a form numerous times before it could be submitted to HR or the applicable department. With Nintex solutions, an employee now uploads the applicable document, completes a Nintex Form specifying the signers and receivers, and submits the request. 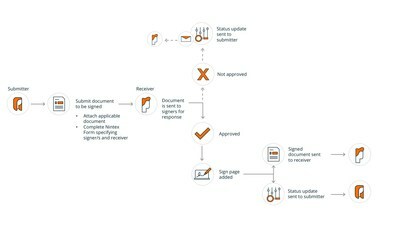 Once submitted, all signatories receive a sign-task request which when completed adds a signature stamp at the end of the document. The completed document is sorted into the organization's archiving system and the employee is notified of the approval status. "We're pleased to recognize MAN Diesel & Turbo for its innovation in process automation," says Nintex Chief Customer Officer Josh Waldo. "By automating processes in HR and across departments, the company is creating greater efficiencies while improving its overall employee experience – MAN Diesel & Turbo employees now can spend more time on strategic work and less time bogged down in manual processes." The Nintex Solutions Awards were designed to recognize organizations who have demonstrated excellence in process automation by successfully using capabilities within the Nintex Platform. Today thousands of enterprises worldwide across industries such as financial services, health and life sciences, advanced manufacturing, government and others, turn to the Nintex Platform every day to automate, orchestrate, and optimize simple to sophisticated business processes. Nunes will join Nintex at the Intelligent Automation Week in Chicago, July 30 through August 2, 2018, where he will share his company's digital transformation success story with attendees. To learn more about how enterprises are using Nintex to automate processes across departments, see use cases on Nintex.com.